The Travels of Marco Polo always cheers me up! Marco Polo related his experiences between 1276 and 1290 to his prison buddy, Rusticello da Pisa. The prisoners of war collaborated and came up with this fantastic book. It was written in langues d’oil, a language that is no longer in use. My edition is a reprint of the translation by William Marsden in the eighteenth century. In the thirteenth century, Marco Polo’s father, Niccolo, and uncle, Maffeo, successful traders, were invited by an envoy of the Mongols and made a trip to the East to meet the Grand Khan. They returned to Venice after seventeen years of adventuring to pick up some holy oil and give the Pope a letter from the Grand Khan. The Grand Khan, being Kublai Khan, desired to introduce Christianity into China. The Khan wanted the Pope to send a hundred representatives to support the spread of Christianity. The two brothers had to wait a long time as the Pope had died and it took time for the new Pope to come to power. That was when they met Marco Polo the first time for Niccolo had left behind a pregnant wife who gave birth and died in the interim.Marco had been brought up by his uncle to be a trader. Niccolo and Maffeo took Marco with them for the next set of adventures and it is from Marco’s recall that this book was created. He wrote this book most likely for the trading community. However, what has come down to us in the translation is a very poetic and interesting account of the East. The description of Shandu in this book inspired Coleridge to write Kubla Khan, one of the most enchanting poems I have ever read. Perhaps, he read the same translation as I did, the one by William Marsden. Most of the world regard Genghis and Kublai Khan as the worst kind of tyrannic rulers. However, in Marco Polo’s narration, the Grand Khan comes across as a competent ruler who provided security to his subjects. Trade prospered. It was Kublai Khan who popularised paper currency in China. Marco mentions it in his book. Marco worked for the Grand Khan as an envoy for a number of years. The book is about his travel to and from China to the surrounding provinces and then his return to Europe. It took the party three years to reach China with the holy oil and gifts. The new pope had sent two representatives instead of one hundred. The two monks had absconded during the journey. The Grand Khan did not penalise them for not getting the hundred men but expressed happiness on seeing his old friends and Marco. The thing that I really like is the open mindset of Marco Polo. He has no preconceived notions and takes people as they come. His father, uncle and he were multi-lingual. They could pick up languages easily. They all picked up tartaric, the language spoken by Kublai Khan, even before they met him. The Polos truly embodied the spirit of a one world society. They could take the best from every culture and survive under all circumstances. They knew no borders where trade was concerned. The authenticity of Marco’s rendition has often been questioned by erudite scholars. Marco has been represented as a charlatan who made up a tall tale. However, what I do see in the story is an open-minded, large-hearted adventurer who did not acknowledge pre-conceived biases of the medieval world, rose above all pettinesses and recorded a fantastic travelogue with the collaboration of a friend. The retelling is of his own personalised experiences. That the book has survived seven centuries of intellectuals and is still regarded as worthy of debate makes it an eternal classic in my perspective. 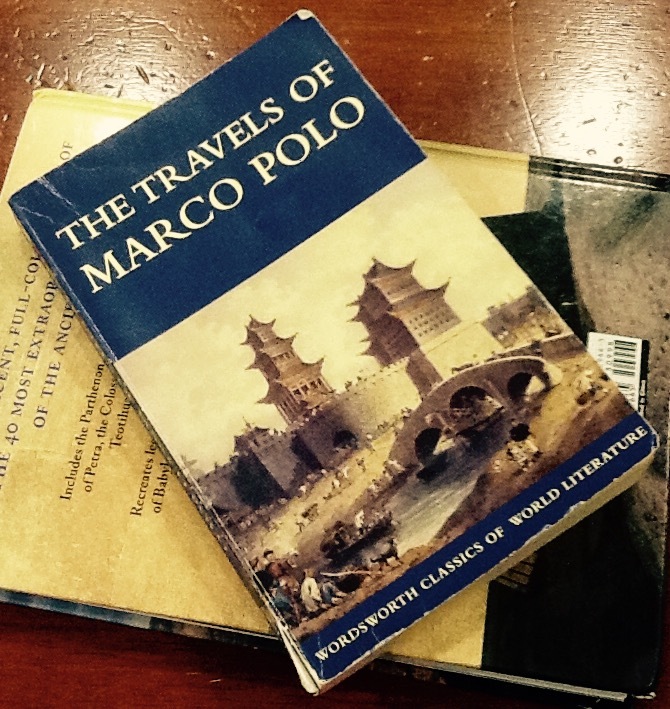 Marco Polo’s travelogue has an infectious spirit of optimism and a one world outlook beyond borders.